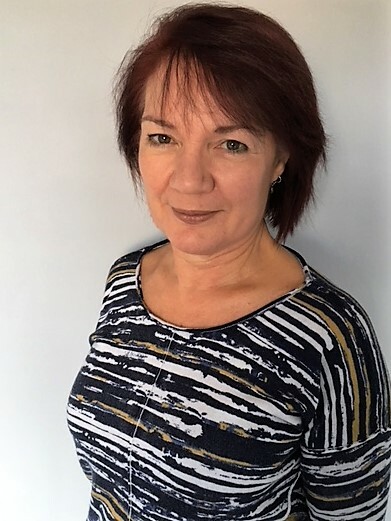 Hi, my name is Linda Hoyland and I have been a complementary therapist for around 29 years now. I started out working as a chemist in research and development for the pharmaceutical industry. When I was pregnant I became quite ill and the only thing offered was drugs which I really didn’t want as an expectant mum. After having my son I went to Yoga classes and through these, went to a talk on Reflexology. As a scientist I was hugely sceptical and felt it didn’t make sense, however part of me was intrigued. So I found out more about it and eventually qualified as a reflexologist whilst pregnant with my daughter. I love working with clients with reflexology and had amazing results, but I realised more could be done and so started looking for something else and eventually found the “holy grail” of therapies – kinesiology! I trained with Terry Larder in Classical Kinesiology which was one of the best courses I have ever done – the other being teacher training, which allowed me to then teach Foundation Kinesiology for Terry! I have since added Brain Gym, some Health Kinesiology, Kinergetics as well as numerous other skills from the courses that Terry offers. I love working with kinesiology because it is such a multi-faceted approach that the body really has no option but to change its old unhealthy ways for new happy ones. During my time as a kinesiologist it has not only given me my health back, it has allowed me to achieve many things I would never have thought possible – teaching for one! I am part of the KF Policy Board working on the Training Standards team for the last 5 years. I have also added High Touch Acupressure (Jin Shin) and Vortex Healing to my therapeutic techniques and am a member of the Association of Reflexologists. I continually update and add to my skills, knowledge and experience as a therapist. One of my special memories is from when I went to Bosnia with a charity, to work with people there who were still suffering from the after effects of the war. I met some lovely people, the team I went out there with as well as the Bosnian people themselves. I feel that in the short time we were there we touched their lives in a very positive and effective way. If you would like to know more about it: read about my experiences in Bosnia. I have been hugely fortunate to have brought up my children using reflexology and kinesiology for their health and no medication whatsoever. As a therapist for over 25 years I offer a truly holistic approach, looking at all aspects of a person’s health, not only addressing structural, environmental and nutritional needs but also helping the release of emotional stress. I enjoy working with clients and love seeing how much they benefit from the treatments in all sorts of ways. I have seen hundreds and hundreds of clients over the years regain their health and achieve their goals. I have met so many inspirational people and made many friends within this field. And most remarkably – I have recently collaborated with 3 therapist friends and we have launched an online programme for people to Skyrocket Your Energy in just 7 Days! Please contact me for more details. Kinesiology truly is life changing!